BNP Paribas and the ITF have announced the next phase of their long-standing association, focusing on women and junior tennis while ending the ‘Davis Cup by BNP Paribas’ title sponsorship. - BNP Paribas and the International Tennis Federation (ITF) have decided to conclude 17-year title sponsorship of Davis Cup. ’Davis Cup by BNP Paribas’ thus rebrands as ’Davis Cup, The World Cup of Tennis’. 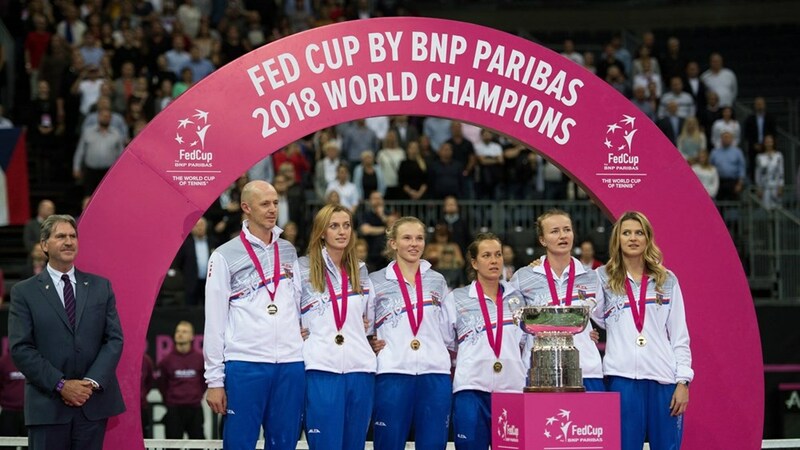 - BNP Paribas title sponsorship of the ITF women’s competition ‘Fed Cup by BNP Paribas’, junior tournaments ‘Junior Fed Cup by BNP Paribas’ and ‘Junior Davis Cup by BNP Paribas’, the wheelchair event ‘BNP Paribas World Team Cup’ and ITF coaches conferences continue. - BNP Paribas, which has supported tennis for more than 45 years, reaffirms its commitment to support all levels and dimensions of this sport, in France and abroad. BNP Paribas and the ITF have announced the next phase of their long-standing association. This partnership, which began in 2001, has brought significant success to the development of the ITF Davis Cup, Fed Cup and Junior Davis and Fed Cup team competitions, in France and globally. The ITF, as the global organisation responsible for the development of Juniors tennis and the custodians of the Fed Cup competition, welcomes the continuation of this partnership which sees BNP Paribas continue its commitment as title sponsor of the ‘Fed Cup by BNP Paribas’ – the world’s largest annual international team competition in women’s sport, launched in 1963 with 108 nations entered in 2019. This partnership also encompasses the continued support of BNP Paribas as title sponsor of the ‘Junior Davis Cup by BNP Paribas’ and the ‘Junior Fed Cup by BNP Paribas’. “We decided with the ITF to conclude the ’Davis Cup by BNP Paribas’ partnership as the competition’s format evolves,“ Bertrand Cizeau, Head of Communications and Deputy Head of Company Engagement at BNP Paribas declared. He added: “We wish the best for the next phase of this competition and are keen to continue to develop our action, together with the ITF, for women and junior tennis players. David Haggerty, President of the International Tennis Federation, said: “BNP Paribas has made a vast contribution to the success of Davis Cup as title sponsor over the past 17 years. We are proud of the great work we have achieved together for Davis Cup, and we look forward to continuing our relationship across a number of properties from the grassroots to the top of the game. BNP Paribas enhanced its engagement for young players in 2018 and 2019 with the launch of three young tennis talent programs, with Jo-Wilfried Tsonga (’BNP Paribas Young Talent Team’), John and Patrick McEnroe (‘BNP Paribas Mac 1 Team’) and Yannick Noah, through his charity organisation ‘Fête le Mur’ (‘BNP Paribas Kids Fête le Mur Team’). Through these programs, BNP Paribas will support no less than 50 young hopefuls in 2019 in order to help them reach the highest level of competition.